Exeter head coach Rob Baxter hopes new England head coach Eddie Jones will take a close look at his Chiefs squad. Jones was appointed last week after Stuart Lancaster left the role. 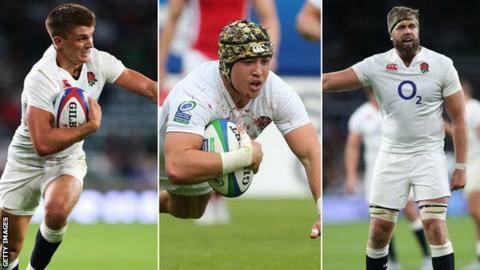 Exeter had three players in England's World Cup squad, but 2014-15 Premiership top try-scorer Thomas Waldrom and Dave Ewers missed out. "It's great for me as a coach that there's a new guy in there and that he'll start judging on what you achieve now," Baxter told BBC Sport. "I think that should be an improved motivation for our players to play well most weekends, but especially well this weekend," added Baxter, whose second-placed Chiefs side take on third-placed Harlequins on Saturday. "There's a number of international players in the Harlequins team and if you knock them over that obviously bodes well for how you stand as a player and how you stand as a team, which are both equally important when it comes to international selection." Baxter, who assisted Lancaster on England's 2013 tour to Argentina, reaffirmed his commitment to the Chiefs, and said he was yet to meet the new national team manager. "I want to have a chat with him and see what he thinks and where he wants to go forward and I want to promote our top talent at the club," he said. "It's interesting that he's said he's going to start with a clean sheet and I think that's exactly what we want at this club. "We've slowly improved our standing in the game over a number of years, we're currently doing pretty well in the Premiership and are in the Champions Cup, so we feel pretty good about ourselves. "We've got some good young English talent and some decent proven English talent as well."